Product photos are screen grabs off the Stolen Catalog. Take a peek to see their whole line up! Let’s get the basics. When did Stolen become a company? Were you the only guy starting it, or who else had part in that? Stolen became a company in 2002. My partner, UK BMX Pro Anthony Revell started it. I came along the second year and became partners the third year. No one else is involved in ownership. My wife and I own the US STLN/Greasy Comb offices. Where are you guys based out of these days? Have you moved or expanded at all over the years? We have offices in the UK and here in California. In the UK everything is set up at ‘The Farm”. We are looking at buying a new bigger spot over there near Bournmouth in the south of England. In the US we just started moving to our new warehouse/office. 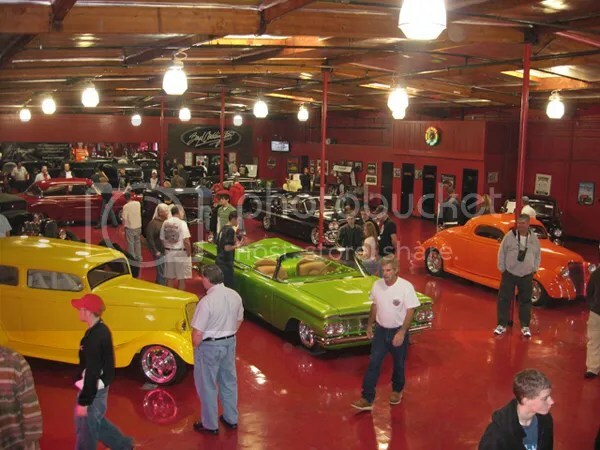 We are taking over the Boyd Coddington (of the Discovery Channels American Hotrod fame) warehouse/offices. This space is 5 times the size of the current building we have now. It has two floors and the set up is much cooler with a 5000 square foot wooden park, a lounge, kitchen, his and hers bathrooms, a shower and sleeping area for visiting riders. Who are the people that keep Stolen running on the day to day with you? I do all the ad stuff, catalog, logo’s, etc.. I still do most of the designs but we have Paul and Kenny taking new projects on by themselves which is a welcome relief for me. Christine handles the book keeping and office management. Anthony handles the UK office and all distributor sales as well as the general business direction of the company. We have Leroy and PJ as TM’s and that is about it. What is a typical day like for you? Is there such as a “typical day” for you? It seems that anymore there is no such thing as a typical day. I often wake up early with my 4 year old climbing over me to sleep next to his mom, I rarely get back to sleep so I start off with a cup of Joe and check my email, facebook and rss feeds. Then I help get my two kids and myself ready for the day. My wife takes the kids to Montessori school and I head to Starbucks for an espresso. I was riding to work on most days but then I got a cool new car so I have driven a lot over the past month. The office morning is made up of meetings, answering emails and my daily skype phone meetings with the UK office. I have my own office and rock out all day. I have 47,514 songs, all album on my hard drive so I take it pretty serious. I shoot all the photos here, do video shooting, editing, ads, web, t-shirts, etc… So my after noon’s change all the time. I go home about 5:30PM and chill with the family most nights. I have been going classes lately to get my open water SCUBA certification. What are some of the goals that you have for Stolen? In a perfect world what would you like to see happen in the next year or two? We have specific sales goals every 2 years or so. We have met or exceeded each of these to date and hope to continue to do this. Sometimes we have growth spurts for instance we went from having about 6-8 distributors in 2008 to having more than 20 today. In a perfect world?… I am realistic, this doesn’t exist. If we continue to work hard and be cautious things will come naturally. Most of our goals are sales based but we also have long term goals to stay relevant. It appears that you have a ton of completes and new stuff coming out for 2010. What are some of your favorite Stolen 2010 items? I like a lot of the stuff we do but I think the Cheater and Sinner build kits are my favorite. There are so many cool companies that don’t make complete bikes but make bitchin’ frames. Now you can have a quality complete with the frame you want at an affordable price. I also like the Revolver rims/wheels. These rims are a great product at a really good price. As far as bikes my favorite is by far the Sinner series. You recently made al trip over to your manufacturers. Can you give us a few hints of things you are working on for next year? I did just come back from Asia but unfortunately it was my fourth trip this year. We sorted much of 2011 out on this trip or at least get the ball rolling. We will introduce an entry level 25x9t bike called the ‘Casino’, We are working on a new chainring, a new unique headset, a new hub set from scratch, a new wedge stem, new grips, Thermalite pedals and a cool new frame called “the Cherry” because some of our customers suggested we don’t call the frame the “Stolen Virginity” frame. You guys are the only ones next to Dan’s Comp who offers a complete parts package. What made you guys want to do that? Do you think it will catch on more? I really think it is the way to go. Most kids that build a full custom bike would be better off going with a build kit and changing to individual parts as needed. I thought of creating these kits because most complete bike sales stop at about $600.00 and custom bikes start at about $1,200.00 That is a really big gap that I felt needed to be filled. This is our answer, but nobody besides STLN has caught on to this concept yet and I am stoked because the kits are selling really well. Does Stolen have any plans of branching out into other markets like cruisers, fixies, mountain bikes, or anything like that anytime soon? I don’t think Stolen will branch out beyond freestyle bikes anytime in the near future. We have projects that we work on outside of freestyle like some Fixie and cruiser bikes we help out with but my passion is still in the street/park stuff. John Hick is on our flow team and in addition to being a great rider he is also a great videographer/editor. We just signed Phil Aller from the UK who is on a similar level to Hicks with the video stuff so a video is in the future but just unsure if we want to have a DVD or continue to publish web edits. Who is all on team now days from pro, flow, and down to the people you hook up from time to time? How do you guys go about picking new riders for the team? Any advice for the kids looking to get hooked up? We normally get a rider through another rider. Kareem for instance was a hookup through Jake Seeley. Morgan was introduced through Eben Fischer, our UK team was all hand picked by TM Leroy Maidment. If you are into what we do send us a resume. We are looking for a banger but have not found anymore than we already have. What’s your warranty process like? Who should somebody contact if they have an issue with one of your products? What kind of turn around time can somebody expect if they need something replaced? We’ve had a dedicated customer service team for years. Currently PJ Alfaro runs that section. Any issues with Stolen products you can write to warranty@stolenbmx.com When you write or call us we issue an RA# and then when the product is received in our office. We almost always get products repaired or replaced and on its way back to the rider within 48 hours. We are now offering a Lifetime warranty on the Team Cranks and since then we only had 2 more reports. Every part is different but the current bikes have a 1 year frame warranty and a 3 month part warranty. What if somebody has a general question about Stolen? Who should shops and distributors contact if they would like to carry Stolen products? Do you guys ever get into any trouble or weird situation because all your bikes are “Stolen”? Not to much unless we mess around. When we first started the US office we got all our product from the UK office and we listed with customs that we import Stolen Bikes from the UK. That drew up a red flag and I had a little explaining to do. Anything else you want to say that I might have missed? I think you pretty well covered it. For more visit www.stolenbmx.com is all I would add.